Finding the right porch or deck builder can be a daunting task. We’d like to help you think through a selection process to use when considering us or any other company. By doing so, we hope you’ll feel comfortable with the due diligence you put into making your decision, no matter whom you choose. Ask around: If friends, family members, co-workers, or acquaintances have had an outdoor living space built in the last five years, ask what company they used and how they felt about their experience. It is important to have great customer service throughout the process as well as a great result at the end. Find out what services they provide: Know what services the deck and porch builder offers. For instance, at Archadeck of Raleigh-Durham, we are a custom design and build firm. While we do have some pre-designed projects available, our expertise is creating a unique project to fit your exact home and lifestyle. Some other contractors may only offer pre-designed options or may be less comfortable with complex projects. Check online reviews: A great place to look for known issues is through the Better Business Bureau. If there have been any major issues with the company, the BBB generally will have a report. You can also use Google to search “[Contractor Name] complaints” to get the full picture. Meet the builder: Once you’ve finished your initial research and feel you are ready, schedule a consultation with the company to obtain a bid. Get a sense of the person you’ll be working with and ask for examples of their work to verify their expertise. Since you’ll be working closely with this person and their crew for a few months, it is key that you feel comfortable with each other and that communication is clear. Check References: Even if you have a trusted referral, it can also be useful to speak with other references for the deck or porch builder. And, it is especially helpful to see a company’s work in person. 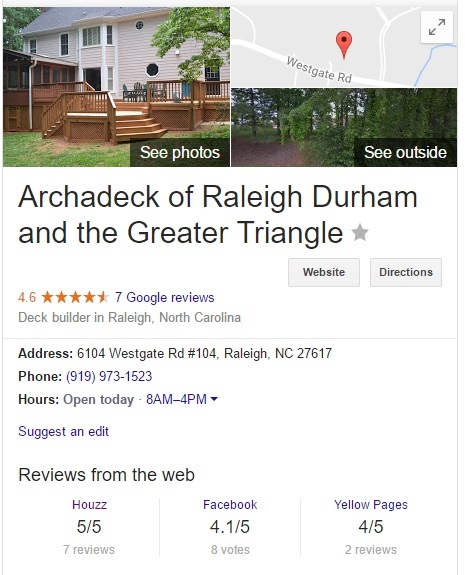 At Archadeck of Raleigh-Durham, we will connect you with clients who would be happy to let you view our work in-person at their home. Check for license and insurance: It is essential that your builder is licensed and insured and offers a warranty on their work. No matter how good you feel about a company or how strong their reputation is, unforeseen events can happen. Protect yourself and your investment by making sure the deck and porch builder you choose is licensed and insured in case of accidents. Also be sure they offer a warranty backing up the quality of their work. At Archadeck of Raleigh-Durham, we have the best industry warranty, including a third party guarantee that your project will be completed to the specifications in the contract. Accurate contract scope: Once you’ve chosen your deck or porch contractor and they’ve provided a suitable quote, make sure the scope of work is exactly what you’ve outlined in discussions to avoid added costs later. If any element is missing from the scope or the design, ask the company to add it in before you sign the contract. The contract should provide a clear picture of the project, its costs, the payment schedule, and other important service terms. We are confident if you take the time to learn about the reputation and professionalism of a deck and porch builder, you will make an excellent choice and be on your way to enjoying a new outdoor living space soon. If we can be of further service to you, give us a call at 919-973-1523. We look forward to meeting and working with you!